A car load of two or three males will pull up to someone at a convenience store or shopping center parking lot and it’s “Pssst, hey buddy. Want to buy an Apple iPad or MacBook?” They will tell the victim they are for sale for $300 each or both for $500. The Apple products are actually painted wood or loose leaf note books with the Apple logo on top and wrapped in bubble wrap. They are in a Fed Ex or Best Buy box and sealed up with tape. By the time the victim figures out the purchase wasn’t what they bargained for, the crooks are long gone. Grand Prairie has had over a dozen such crimes committed since January of this year. The suspects have been mostly black males. However one offense involved a black female as well. The vehicles used vary in most cases. There appears to be several groups of thieves and sometimes the suspects never even get out of the car. The public should be advised that it is unwise to purchase anything from the trunk of a car, no matter how good the deal seems. 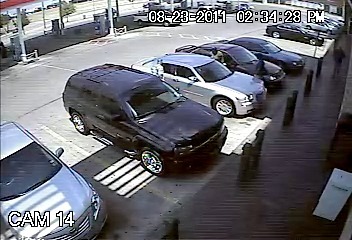 The silver Chrysler 300 in the above picture was allegedly used in one of the offenses. Anyone who has information about the suspects should call Grand Prairie Crime Stoppers at 972-988-8477 or the Grand Prairie “Tip Line” at 972-237-8877. You know, if you are dumb enough to get ripped off by this scam, you might possibly deserve it. Pssst, I have a Thousand Dollars here. You can have it for Three Hundred. LOL That's up there with the Wallet Inspector. But let's consider the 'victim' thing here. Who in their right minds would a) buy from some dodgy guys in a parking lot for a 1/3 of the price and b) not inspect the item first? If you believed the product to be genuine, then you're basically admitting you'd buy stolen goods. No way could you say you thought it would be anything else, like a legitimate sale. And if you didn't check the iThing... well, then you're an idiot. So... in a way... the only people losing here are gullible idiots who would have bought stolen items. I would only buy an iPad from a car trunk if I could test it on the spot, and if it had almost no bloodstains. Aren't they at risk of getting shot? I mean it is Texas.